The 2 helpful hacks you can use, to have it before summer. This fantastic little observation can apply to almost any area of life. It really made me think, many of us could be accused of being insane when it comes to our training and our nutrition. Back in my mid-teens, I was an average, skinny kid who lacked self-confidence and any proper experience in the world of fitness. In my early days of training, I began in a commercial gym mid-way through my “awkward years” of high school. My training was scattered and lacked a proper structure for progression. However, there were a couple of exercises and habits I would often keep consistent. I loved the bench press and always finished my workouts with some arms exercises. Get your tickets to the gun show ladies, they’re selling out fast! Yep, I started out just as many ambitious teenage guys do with their training and sure I experienced some results (noob gains aren’t overly hard to come by thankfully), but I quickly hit a plateau. I tried to increase my weights, feed my ego and find some sort of progress but I was stuck. The weight on the bar stopped increasing and so did my muscle mass. I was eating right and training hard but was nowhere near the body or confidence level that I had hoped to achieve when I set out to improve the way I looked and felt originally. What was I doing wrong!? Insanity. I was doing the same thing over and over again with my training. The same routine, the same exercises for over a year! I didn’t change up my rep ranges and barely ever threw in a new exercise. Not to mention the fact that my eating never changed and I wasn’t eating enough protein or even food in general to help facilitate my desired level of muscle growth. It doesn’t matter whether your goal is to drop 10kg of body fat, or add 10kg of lean muscle, or both, the principle is still the same. If you don’t have a certain level of variety to your training, your body will eventually adapt and your results will begin to stall. We’ve all experienced a plateau at some point in our training or weight-loss journey. It happens. But with these 2 helpful hacks, you can avoid plateaus and be well on the way to the body of your dreams before summer rolls around. Give your routine a spring clean. 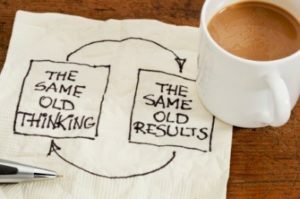 If we do the same things, we get the same results – if your routine isn’t giving you results anymore, it’s time to change it. However, it’s obviously very important to get what you’re doing in the gym right in order to see progress. For example, if you’re the kinda gal who is intimidated by the weights section and scurries upstairs to the treadmill every time you step into the gym but your main goal is to tone up and add some firmness to your frame, you may be in for a shock. Or conversely, if you’re a wanna be Arnie kinda guy who wants to stack on some solid muscle mass to your whole frame but you’re too busy just doing bicep curls or lifting with your ego and doing 1 rep max sets of bench press every session, you’re going to struggle to reach your goals. Re-assess what you’re doing inside AND outside of the gym (i.e. your nutrition) and make an honest judgement as to whether what you’re doing is the best course of action for you to achieve your goals. If it isn’t, or if you’ve been stuck in the same routine for a while, then it’s time to change it up. (If you’re unsure about that, then by all means shoot me an email or a message and let’s have a chat about what you can do to start progressing again). When we stop challenging our body, our results begin to slow down. There’s no magic number as to how often you should change up your routine and everyone is different. That said, a standard weights routine for toning up or building lean muscle mass should be slightly altered every 6-12 weeks as a general rule. Obviously factors like your training experience and training style/goals will affect that number but it’s a good basic guideline. Otherwise, you could even consider altering your program if you cease to see progress for more than a few weeks (assuming your nutrition and recovery are in order). Attaining the body of your dreams is simpler than you think. Doing the same thing over and over again will only work for a period of time until your results slow right down. If you’re unsure how to work out how to change up your routine or even just unsure about training in general, then we highly recommend reaching out to the Alpha Fitness team as we’re always happy and willing to help. Jake is passionate about helping women reach their full potential by rapidly transforming their bodies through holistic methods. To find out more, visit www.alphafitness.com.au. This entry was posted in Weight Loss and tagged exercise hacks, why you don't have your dream body yet on September 26, 2016 by jaket. This entry was posted in Weight Loss and tagged fat loss in warmer months, steps to a slimmer spring on September 19, 2016 by jaket.